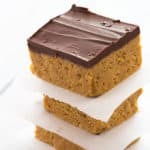 Amazingly delicious No-Bake Chocolate Peanut Butter Bars – Just 5 ingredients and no oven required! Place melted butter, graham cracker crumbs, powdered sugar and 1 cup peanut butter in a large bowl. Stir with a large spoon until blended. Transfer graham cracker mixture to an ungreased 8 x 8 dish lined with parchment paper. Spread well and press evenly with a spatula. Place in the refrigerator for 15-20 minutes to set. Microwave chocolate chips and 1/4 cup peanut butter in a microwave-safe bowl for approximately 2 minutes on high, or until melted. Stir well to combine. Spread chocolate mixture evenly over graham cracker mixture. Refrigerate for at least one hour before slicing. Store covered in refrigerator.